The Sagrada Familia is one of the most famous landmarks of Barcelona, ​​and doubtless one of the most impressive sights of the city. 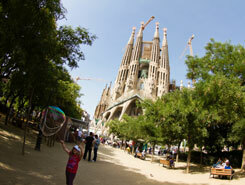 Besides 6 other Gaudi buildings in Barcelona, the Sagrada Familia was declared as a World Heritage Site by the UNESCO. The church is huge in its dimensions and will be even 172 m high when finished. Construction started in 1882 and in November 2010 the Sagrada Familia got inaugurated by Pope Benedict XVI which raised the building to a basilica. This is the life work of the Catalan architect Antoni Gaudi, who significantly influenced the construction with his extraordinary architectural and engineering style, combining Gothic and curvilinear Art Nouveau forms. Gaudi got involved in 1883 and dedicated the rest of his life until his death in June 1926 to the work on Sagrada Familia. Right now around 55 % of the church are finished and the completion is expected in 2026. Eight of the twelve bell towers, standing for the 12 Apostles are finished yet and between 107 and 109 m high.Tthere will also be three medium-sized towers for the Holy Trinity and one central dome with 172 m dedicated to God. Two facades of the three are finished yet: the Nativity and the Passion façade. 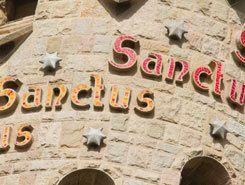 The Nativity façade is dedicated to the birth of Jesus, and decorated with scenes reminiscent of elements of life. This façade faces the rising sun to the northeast which stands as a symbol for the birth of Christ. Gaudi knew that he would not be able to finish the church and chose the Nativity façade to start with, because in his opinion it was the most attractive and accessible to the public compared to the Passion façade. The Passion façade stands in a big contrast to the highly decorated Nativity façade and is dedicated to the Passion of Christ and the suffering of Jesus during his crucifixion. This façade was intended to portray the sins of man and contains of mainly harsh straight lines, ample bare stones and simple and plain forms. The third and still missing façade is the Glory façade, which will be the main façade and also the main entrance of the basilica. This façade will be dedicated to the Celestial Glory of Jesus, representing the road to God: Death, Final Judgment, and Glory, while Hell is left for those who deviate from God's will. You will also see there representations of the Seven Deadly Sins, and at the top, The Seven Heavenly Virtues. The facades and towers are already quite impressive, but the interior is simply breath-taking. 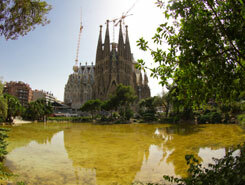 We do not want to tell too much, have a look by yourself at this unique and incredible work of Gaudi. You can get your tickets at the main entrance (with sometimes standing quite long in the line), but also at the Servicaixa ATM’s or online, with which you can use the less frequented entrance for online tickets.